Stormwater management is now an integral part of our interaction with our environment. Increasing development and urbanization of our lands has led to changes in the natural environment that include increases in flooding, degradation of water quality, erosion, and sedimentation of our waterways. This in turn has led to measured impacts to the stream and riparian ecosystems including decreases in aquatic biodiversity and inability of the natural system to accommodate the full range of flows that occur from storms to droughts. To reduce these impacts, we are now implementing stormwater management plans in most urban areas. The University of Virginia owns and maintains its own small municipal separate storm sewer system (small MS4). The MS4 consists of all interconnected storm sewer pipes on grounds. UVA’s MS4 discharges into Meadow Creek, tributaries to Moores’ Creek, and in some cases, into the City of Charlottesville’s storm sewer system. In order for the University to discharge its storm water into state surface waters, the University is required to have a Virginia Pollutant Discharge Elimination System (VPDES) permit. The VPDES permit requires the University to adhere to strict pollution control measures in order to minimize the amount of pollution entering state waterways. 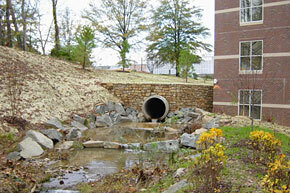 As part of UVA’s program, the University is required to educate its students and staff about storm water impacts, detect and eliminate illicit discharges, control storm water runoff from construction sites during and after construction, and prevent pollution generated from the day-to-day operation of UVA facilities.